The Duchess of Cambridge’s wedding dress is for certain has attracted not only the fashionable but the fashion designers as well around the world. There has been claims that the dress itself copied and have the same resemblance with the wedding dress worn by another recent royal wedding of Isabella Orsini. Both dresses have a v-neck line with a lace bodice that was both long sleeved and high-necked. The Duchess’s Alexander McQueen dress, designed by Sarah Burton, bears a striking resemblance to the outfit worn by the actress Isabella Orsini when she married Belgian Prince Edouard de Ligne two years ago. Ms Orsini’s dress was designed by Gerald Watelet, the Belgian designer. The print media across Europe have dubbed the Duchess ‘copycat Kate’ due to the similarity between her dress and that of Ms. Orsini, who is the goddaughter of Silvio Berlusconi, the premier of Italy. 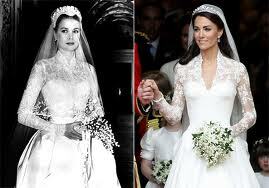 Both women are pretty slim brunettes who complemented their gowns with a tiara that held their veil in place. 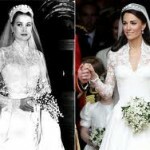 But both bridal gowns pay tribute to an earlier wedding dress design worn by Grace Kelly on her wedding day to Prince Rainer of Monaco in 1956 due to its striking resemblance. Fashion experts calling Kate Middleton’s gown a ‘modern take on Grace Kelly’s dress,’ a true reflection of her personality.